Sometimes we need to check linux memory usage, there are many GUI tools like KSysGuard or GNOME system monitor. But here we are focusing on the CLI tools, which could be used with shell scripts, over SSH, serial port to check linux memory usage when using a GUI tool is not possible. Amount of available memory keeps changing quickly between used, free, shared, buffers and cached, though total amount memory in a system is fixed, let's start. One of the most used command to check memory usage in Linux or any UNIX like OS, even available in most embedded systems. Just run the command like bellow, no root privilege required. It's worth to pass few more command line arguments to get more convenient results. -s , continuously print results with a delay. Show linux memory usage in human readable form for 10 times with 0.5 second interval between results. Reading memory usage from this file is specially useful for scripting purpose. All results available in this file are formatted into multiples of KB , use cat , grep, awk or your favorite text manipulation command to get the desired result. These commands above could be handy to get linux memory info when other commands are not available, like on embedded systems or OpenWrt routers. This dmidecode command is more hardware specific, useful to know about the computer's hardware without opening it. Use the DMI type 16 and 17 to get the memory related information. This command requires root privilege, examples bellow. This command is particularly useful for RAM upgrade and hardware related troubleshooting purpose, some more useful dmidecode commands here. Note: Actual available memory is always less than the amount get from the dmidecode command. Use the -m command line argument to get memory related info, this command prefers to be run as super user. Note: Atop considers RAM usage more than 90% as critical. 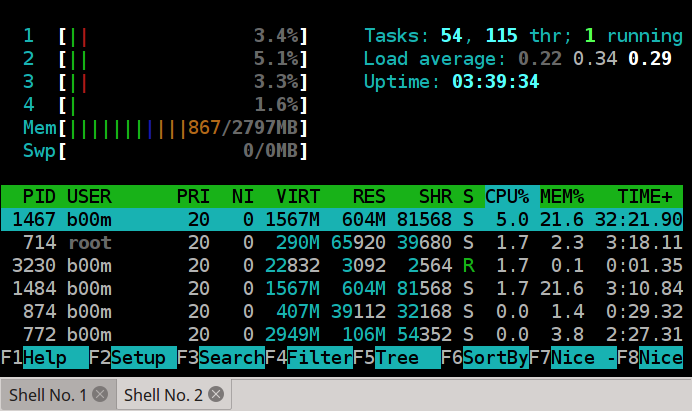 Both top and htop are interactive process and system resource viewer, while the htop provides a ncurses based colorful interface. Top is installed in mots system by default, you may need to install htop, on any De bian based distro install it with apt . It's normal that Linux using some more memory than expected, but it's normal. This extra memory is for caching purpose to make the system more responsive, there is a dedicated site for this, Linux ate my RAM!. So that's it, how to check linux memory usage with command line tools. If you have any suggestion or question, just drop a comment, I'll be happy to hear from you. Hey thanks for article, these CLI tools are great to check linux memory usage, but you might also want to include the vmstat command in the list. Thanks ! indeed the vmstat command is very useful, I'll include it too in the list.